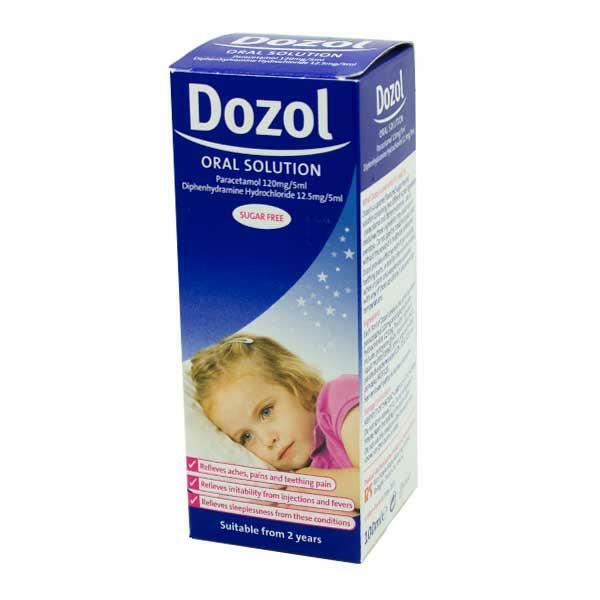 Dozol is a painkiller for children aged between 2 and 12 years. This caramel flavoured oral solution contains both paracetamol and diphenhydramine hydrochloride. This medicine is also free from sugar and includes a dosing syringe. You Must Be Aged Over 18 Years to Purchase This Product. MAXIMUM OF ONE BOTTLE PER ORDER. Cannot be purchased with Teedex. Do not take with any other paracetamol products. Children 2 – 6 years, give 5-10ml (3 to 4 times daily). Children over 6 years, give 10-20ml (3 times daily). Never give more than the recommended dosage in any 24 hours and leave at least 4 hours between each dose. Dozol contains Paracetamol, which is a painkiller suitable for children between the ages of 2 and 12 years. This medication helps in relieving pain from such ailments as toothache, sore throats, earaches colds and flu and general aches and pains. This medicine also reduces high temperatures and fevers associated with infections such as chicken pox, whooping cough, measles and mumps. It also contains diphenhydramine hydrochloride which helps with sleeplessness associated with the above illnesses. This medicine can be used by toddlers and children between the ages of 2 and 12 years. If you are pregnant or trying to become pregnant, please consult your doctor before purchasing or taking this medication. Drowsiness, headache, dry mouth, nose and throat, blurred vision, upset stomach, difficulty passing urine, phlegm on the chest.